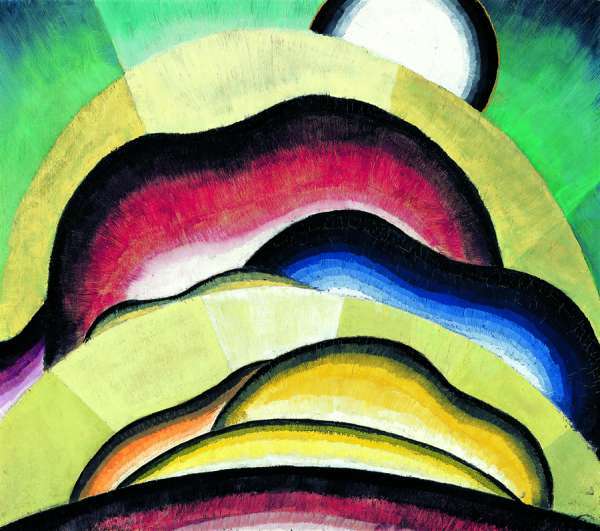 Arthur Dove, Sunrise, 1924. Oil on panel, 18 1/4 x 20 7/8 in. (46.4 x 53 cm). Milwaukee Art Museum. Gift of Mrs. Edward R. Wehr. Milwaukee Art Museum (photo by John R. Glembin); Courtesy of and copyright The Estate of Arthur Dove / Courtesy Terry Dintenfass, Inc.
American artists Georgia O’Keeffe and Arthur Dove not only shared a love for nature but influenced each other’s work. Many of O’Keeffe’s works depict the mountains and wildlife of Lake George, New York, and the flowers and southwestern landscapes of Santa Fe, New Mexico. Dove’s youth in Geneva, New York, gave him a deep appreciation for the natural surroundings. This shared passion for nature inspires a free family day on Sunday, August 2, from 11 am to 4 pm, at the Sterling and Francine Clark Art Institute. The exhibition Dove/O’Keeffe: Circles of Influence will be on view, and the day will feature art activities, live animals, entertainment for all ages, local food vendors, and more. Admission to the galleries and most activities is free on this festive day. Scott Jervis from the Berkshire Museum will introduce families to interesting creatures native to the Southwest. Get up close and as personal as possible with lizards, snakes, and other desert inhabitants. Dove and O’Keeffe were less concerned with making pictures that looked like “real” people or things. Instead, they tried to capture and present the essence of a thing, both seen and unseen and called these works “abstractions.” Try your hand at using natural materials to create abstract three dimensional collages like Dove’s assemblage of twigs called Rain. Georgia O’Keeffe, Jack-in-Pulpit - No. 2, 1930. Oil on canvas, 40 x 30 in. (101.6 x 76.2 cm). National Gallery of Art, Washington, D.C. Alfred Stieglitz Collection, Bequest of Georgia O’Keeffe. 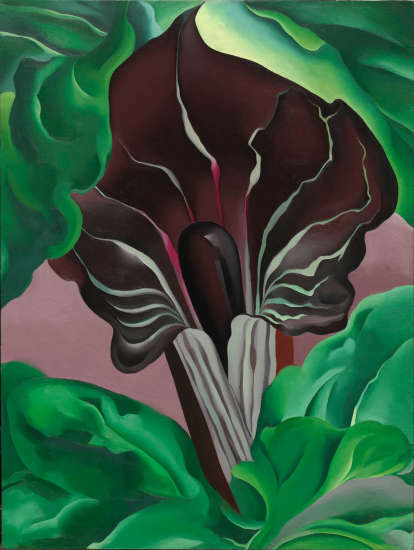 Image courtesy of the Board of Trustees, National Gallery of Art, Washington, D.C.
Dove and O’Keeffe enjoyed listening to different types of music and trying to capture the different sounds in their paintings. Try it for yourself with the drawing from sound art activity. The Native Nations Dance Theatre professional touring dance company will present traditional dancing, drumming, and mini powwow performances throughout the afternoon. The beautiful, free-flowing Roving Ribbon Dancers, from Berkshire Dance Theatre, will wander the grounds. Enjoy modern dance by the Lisa Leizman Dance Company or join in a contra dance with the folk sounds of Eric Buddington’s local band CoinciDance. Hooping Harmony will offer instruction on the art of hula hooping. KB Bead Designs will provide materials to make O’Keeffe inspired jewelry. Create a cactus garden to bring home with plants provided by Mount Williams Greenhouse. Fees are charged for these two workshops. Screenings of the original animated film produced by eight- to twelve-year MinervaMation Animation Camp participants will be held at 11:30 am, 1:30 pm, and 3:30 pm in the auditorium. Students produced the film relating to the Dove/O’Keeffe exhibition during a weeklong workshop at the Clark. Where’d You Get That!? will donate all of the proceeds from its sale of candy and Dove/O’Keeffe inspired ephemera to the Northern Berkshire Food Bank. Look for this Williamstown fixture under a tent on the grounds. Tasty, family-friendly food will be available for purchase from local restaurants including the Clark Café with hamburgers and hot dogs; Helen’s Place with wraps and mini fruit cups; Boston Sea Foods with clam boats; Coyote Flaco with guacamole, chips, and quesadillas; Spice Root with an Indian buffet; Hot Tomatoes with pizza; and Lickety Split with hand-dipped ice cream cones. This Family Day is supported by funding from the officers and employees of Allen & Company, Inc.
A visit to the Clark is a rewarding family experience year-round with 140 acres of scenic meadows and trails providing ample opportunities for families to hike, run and play, spot the many birds inhabiting the area, and try geo-caching. The Clark’s grounds are open to the public free of charge. Free admission to the galleries is always offered to children 18 and under and students with valid ID. The Clark is located at 225 South Street in Williamstown, MA. The galleries are open Tuesday through Sunday 10 am to 5 pm (daily in July and August). Admission June 1 through October 31 is $12.50 for adults, free for children 18 and under, members, and students with valid ID. Admission is free November through May. For more information, call 413-458-2303 or visit clarkart.edu.